Active Directory is Microsofts implementation of LDAP directory services for Windows environments. It allows administrators to implement company wide policies on access to resources and services by the users. Active Directory is usually installed in Windows 2003 or 2000 server and together they are called the Domain Controllers. If active directory fails, it would affect the entire user base, as they wont be able to logon to their systems, access critical information from other servers, or send/receive emails. In this section lets see how a Network Monitoring Tool such as OpManager can help administrators prevent Active Directory nightmares! Imagine a scenario where your CEO logs into his laptop and it says access denied. Probably he just forgot to release the CAPS LOCK key or the Kerberos Key Distribution Center Service that plays a vital role in user authentication has stopped functioning and is forcing every Windows user from logging into the domain. Most of the IT helpdesk tickets originate from issues spawning from users trying to access resources outside ones computer. Active directory forms the crux of this ever-active access system. 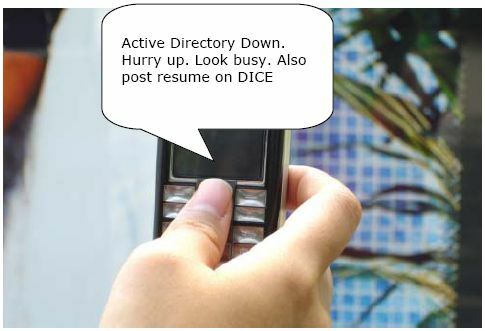 For instance common operations such as user authentication, exchange mail routing, depend on Active Directory. This makes continuous monitoring of Active Directory and related services very important  so that you may also stay away from nasty nightmare! What should you monitor in Active Directory? Hardware failures, insufficient disk space etc., are common problems causing a server to crash. Requests to the Active Directory need to be served fast. This requires the CPU, Memory, and Disk Space of the server that hosts Active Directory to be running at optimal levels and monitored 24*7. LDAP is the client used to retrieve directory information. Monitoring LDAP parameters like LDAP Bind Time, number of Active Connections, LDAP Searches, and LDAP Writes is a proactive step in ensuring its availability. DNS lookup failure can cause problems. The Domain Controller might not have been able to register DNS records, which actually vouches for the Domain Controllers availability. This results in the other Domain Controllers, users, and computers in the domain in not locating this DC which again might lead to replication failure. 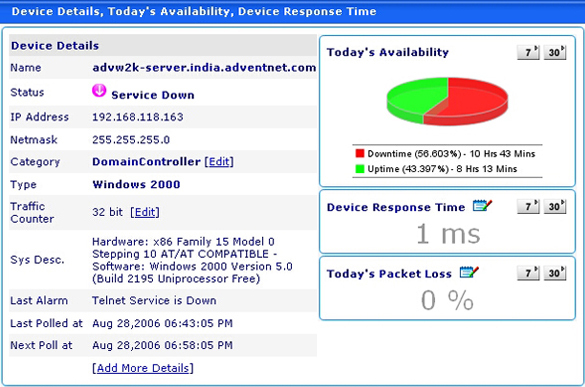 Refer this article for troubleshooting AD related DNS problems. Active Directory depends on this service for authentication. Failure of this service leads to log-on failures. Refer this article to know how this service works. Request to authenticate users is served by this service. Failure of this service also makes the log-on impossible. The Domain Controller will not be able to accept log-on requests if this service is not available. FRS service replicates the objects in Active Directory among all the Domain Controllers in a network (if you have more than one domain controller). This is done to ensure round-the-clock accessibility to the information on the AD. This can be across the LAN or the WAN. When the FRS fails, the objects are not replicated on the other Domain Controllers. In the event of the primary DC failing, when the secondary (the slave) takes over the request, it will not have the user account replicated. This will cause the log-on failure. The replication failure can also occur because of incorrect DNS configuration. There can be other reasons like no network connectivity, too many applications accessing the DC at a time, etc. OpManager monitors all the services and resources on which Active Directory relies for proper functioning. You can configure thresholds and get instantly notified if something is crossing safe limits. OpManager offers a dashboard view of your domain controllers availability with options to see availability statistics for the past week, month, etc. System resources usage gives you real-time status of the health of your domain controller. Details such as CPU utilization, Memory utilization, and disc utilization can be viewed from here. Active directory performance counters such as directory reads, directory writes, Kerberos authentications, etc. can be viewed from here. 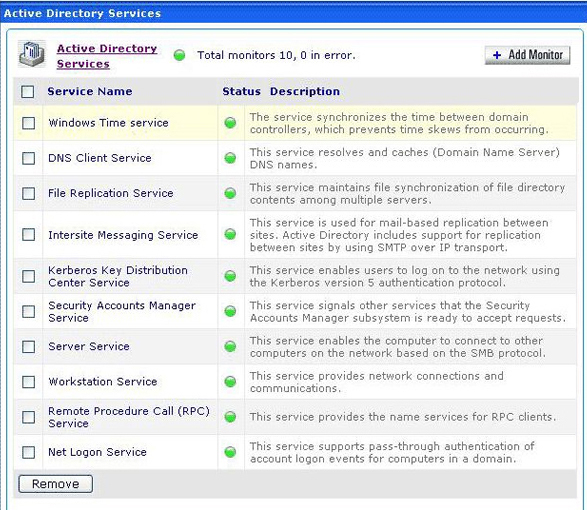 Key active directory services such as Windows Time Service, DNS Client Service, File Replication Service, Inter-site Messaging Service, Kerberos Key Distribution Center Service, Security Accounts Manager Service, Server Service Workstation Service, RPC Service, and Net Logon Service. Heres a tree view of the entire set of parameters monitored by OpManager to ensure that your Active Directory doesnt popup unlikely surprises. Active Directory writes detailed event logs in the occasion of a failure. You can view event logs from your Windows Event Viewer (start - settings - control panel- administrative tools - event viewer). Each active directory component failure has a pre-defined event ID with a detailed message for the failure event. OpManager allows monitoring these windows event logs using pre-defined event log rules. OpManager monitors the event logs and based on the rule it generates OpManager alarms. Besides monitoring the Active Directory components, OpManager raises alarms when a service is unavailable. Configuring response time or resource utilization thresholds for the critical services and parameters alerts you much ahead of the actual problem. OpManager allows you to create and assign notification profiles to Domain Controllers. When any of the monitors fail, an email or SMS alert is sent to the pre-configured Ids. OpManager offers excellent Active Directory monitoring capabilities and helps you stay away from Active Directory nightmares. To test drive active directory monitoring, download the latest OpManager build from www.opmanager.com.